This modern densho should primarily be regarded as basic manual for daily training. The feature of this book is that the individual motion sequences are shown by means of illustrations in order to focus on the performance of the individual techniques and kata. 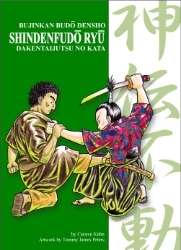 Concise explanations are completing this work which describes the most important unarmed forms of movements of the Shindenfudô Ryû - Dakentaijutsu no Kata . This is the 5th book of the series Bujinkan Budô Densho. Format: 17,0 x 23,5 cm, 104 pages, 200 illustrations.